We all know that words have power. But there is an equal amount of power in the absence of words. Take for instance the recent example of Florida’s Department of Environmental Protection (DEP) ban on using certain scientific terms in all official emails, reports, or other communications. For a lowland state with 1,350 miles of coastline, the omission of terms essential to the study of ocean rise was a puzzling one to say the least. This last April in Wisconsin, a similar phenomenon happened when the Board of Commissioners of Public Lands passed a resolution banning its employees from talking about climate change while on the job. Comprised of a three-member board and ten staff members, the Board of Commissioners of Public Lands distributes investment revenue to support school libraries and makes loans to local governments for public projects. Part of the funding it currently receives is from timber production on lands granted to the state by the federal government over a decade ago. While these conspicuous omissions might not seem like a big deal, such macro-level policies trickle down to our own kitchen tables. For my part, I’ve reached an unspoken détente with my extended family not to bring up certain politically charged subjects over Thanksgiving dinner. Climate change or global warming is among these subjects my extended family avoids so as to ensure civility and familial harmony. But how did the phrase climate change—a name for a scientific theory supported by 97% of the global scientific community—accrue enough of a political charge to warrant deletion from the kitchen table or a state office? Given that climate change will affect—or already has affected—every person on the planet, its status as “taboo” in conversation is not only ironic, it’s dangerous. So how do we talk about this hugely important issue with, let’s say, an uncle who is skeptical about the dangers of climate change? This goes for our friends and family as well. Many see climate change as a distant problem for future generations or people living in faraway places. In short: A problem for someone else. Your uncle might say, “Yeah, yeah, yeah. Why should I care?” Or “We have time.” Or he might be overwhelmed with the weight of global climate change and unable to see his role in addressing it. “What can I do?” he’ll say with a shrug before moving along to the next topic of conversation. Even though 2014 was the warmest year on record globally (coming on the tail-end of the warmest decade), and 97% of scientists agree that this rise in temperatures is primarily due to an increase in carbon dioxide and other greenhouse gases in the atmosphere caused by human activity, it usually doesn’t help to pummel your uncle with these facts. A better place to begin your conversation is to connect the concept of a changing climate to things your uncle can see in his own backyard. For instance, ask him, How are the mosquitos this year? In the upper Midwest, we can count on them every year, and populations will rise and fall with rainfall, and local weather. 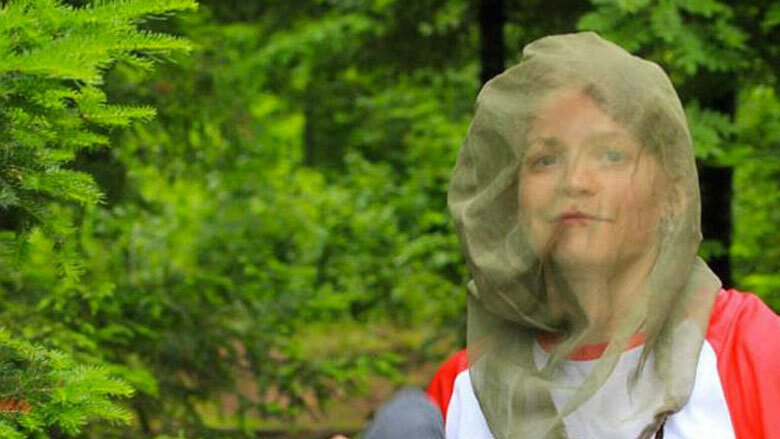 However, over time, climate change is also increasing the range of these insects and other pests, forcing us to resort more frequently to fashionable head nets (see about photo) and use more and more powerful repellents. Both tick and mosquito populations are on the rise in the Midwest—along with cases of insect-borne diseases such as Lyme disease and West Nile virus. Your uncle might counter, “Well, isn’t variability in weather normal?” While this is true, the recent level of variability and intensity of heat waves, storms, droughts, and other events are evidence of disrupted climate patterns. Keep in mind, too, that weather is what conditions of the atmosphere are over a short period of time, and climate is how the atmosphere “behaves” over relatively long periods of time—years, decades, and centuries. The last few decades have shown us that there is a dramatic change in our global climate defined by a continuous trend of warmer temperatures and more extreme weather. I have found that framing most any issue in the context of how it will affect human health or quality of life—say, an angler’s ability to fish his or her favorite stream—is almost always successful in bringing people together in conversation. As we point out our 2014 report Climate Forward: A New Roadmap for Wisconsin’s Climate & Energy Future, “many of the habitats that we think of as Wisconsin are already changing, and so will the life they can support.” This includes brook trout and brown trout. Wisconsin is blessed with over 10,000 miles of classified trout streams. As the state’s average air temperature increases, so does the temperature of its waters. As a cold-water fish, trout are uniquely sensitive to these changes; recent scientific models from the Wisconsin Initiative on Climate Change Impacts show that a five-degree Fahrenheit increase in water temperature could eliminate 95% of Wisconsin’s brown trout population. You could ask your uncle to imagine the effect this would have on Wisconsin’s multi-billion-dollar tourism industry, let alone its vibrant fly-fishing culture. Climate change threatens Wisconsin’s iconic waters in other ways. Intense rainstorm events bring a surge in phosphorus and other nutrient run-off into bodies of water, fueling the growth of harmful algae. For instance, one third of the nutrient runoff flowing into all of Lake Michigan comes from the Fox River, which flows directly into Green Bay. The nutrient-driven algal blooms are damaging to Green Bay’s entire ecosystem, creating a “dead zone” of oxygen-deprived water that suffocates fish and other aquatic life. While the causes of Green Bay’s dead zone are many, climate change is a contributing factor that can’t be ignored. We are already seeing the effects of climate change here in Wisconsin, which makes one wonder what kind of Wisconsin the next generations will have. Will there be trout to fish? Will we be able to save an ailing Green Bay? Scientists predict a 40% drop in snow cover across Northern Wisconsin over the next fifty years. Will there be an annual Birkebeiner? Will there be any place to snowmobile? Will the ice be thick enough for ice fishing? Will we even recognize our state as the “Wisconsin” we know and love today? Many of these climate change impacts I mention are related to the energy choices we make everyday. We need to talk more about climate change and help others see themselves in clean energy solutions, and how these solutions benefit all of us—both locally and globally. Wisconsin and the United States can lead in the research and development of clean energy technologies that would not only be safer for the climate, but for our health and economy as well. When talking with your family and friends about climate change, focus on these “co-benefits” of emission reduction and energy innovation. Energy efficiency saves money and produces fewer greenhouse gas emissions, which is a boon to public health. Remember, change creates opportunity, but that opportunity comes with the responsibility to pursue options that will benefit and sustain the people of Wisconsin, our environment, and our economy in a global context. There is something each of us can do to be part of the larger solution to climate change: Bring it up. Bring it up until Mom asks you to let it go. Or don’t let it go. Do this not because you want to best your uncle in that annual battle of wits during the family reunion (although that might be a perk), but because this is an issue that affects everyone, everywhere. We need to have this discussion. And sometimes the best place to start is at home.